In this undated photo owned by Eva Linn, are the "By Wilcox and Parrish families." It is Photo 239. No individuals are identified. When rural routes opened up in Table Rock, there were two, and one was carried by B. L. Wilcox. As reported in the June 25, 1901 Nebraska State Journal, "TABLE ROCK, Neb., June 25.--(Special.) --The mail boxes for the two new rural mall routes out of Table Rock arrived yesterday, and are being distributed. These two routes will go into operation Monday. July 1. B. L. Wilcox is the carrier on the north route and J. H. Talbot on the south." Photo 648: Carrier Wilcox, undated. Byron Wilcox was a Civil War veteran. He fought in Company A of the 137th Pennsylvania Infantry. He belonged to the Table Rock GAR Post, the John N. Gere Post. A news article in the 1930s reported that only seven members were left alive. Byron Wilcox was one of them. The 137th engaged in significant battles including Sugar Loaf Mountain, Antietam, and Chancellorsville. TABLE ROCK. Neb.. Jan. 13 What is believed by four of the remaining seven members of the John N. Gere Post, No. 120, G. A. R. to have been the last election of officers of the post has been held. The quartet represented the entire attendance at the recent meeting. The four are Fred W. Ault, Peter Gold, Peter Stevens and John H Layman, all of whom are past eighty years of age. Infirmities of age and severe cold kept Edward Wood, another member, from attending the meeting. William Sutton is spending the winter in Texas and the seventh member, Byron Wilcox, Is residing with a daughter in Colorado. Wilcox did not outlive ALL the GAR men, as Boone remembered. John Layman was the last, but only by a couple of years..
With husband Erniest Wilcox, Addie became the mother of 12 children, including Herald, Lyle, Robert, Lawrence, ruth, Doris, Jean, and Dorothy. Ernest Wilcox is on this ball team, Photo 214 (undated), far right. 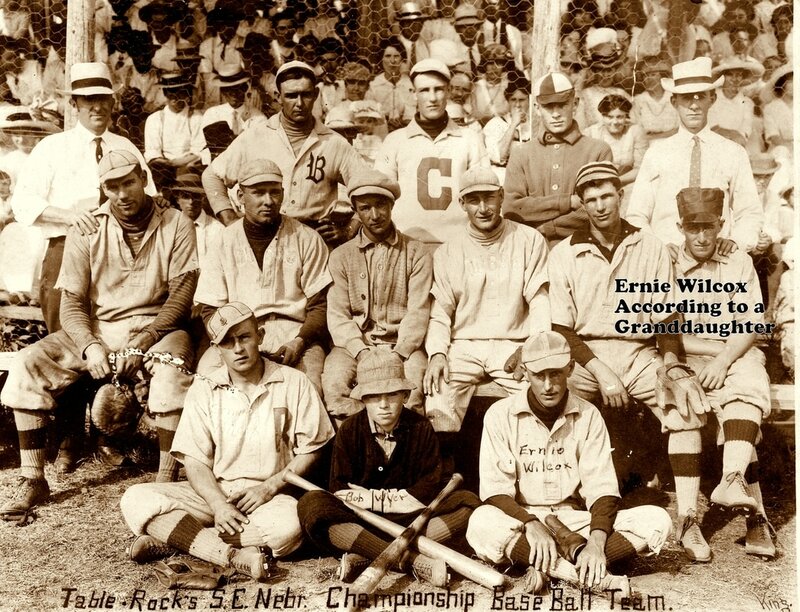 The photo labels him as a young man in the front row, but some of Ernie's grandchildren point out a man in the row behind as Ernie. 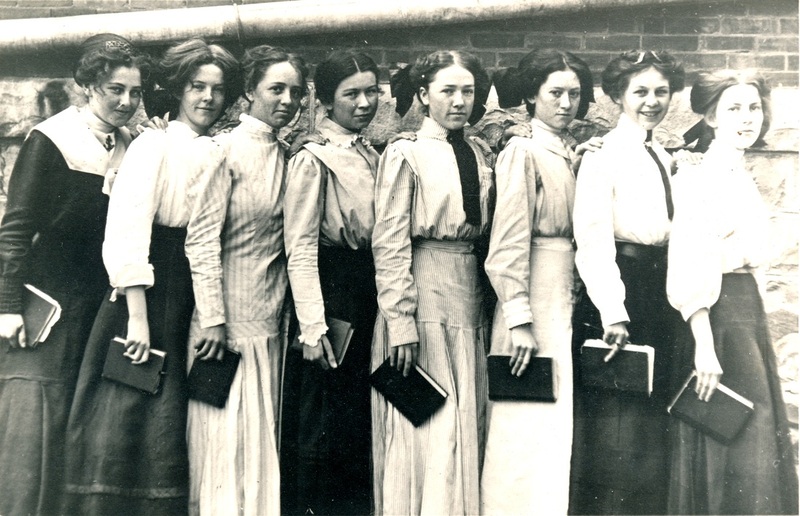 Photo 46 - the Class of 1911. Addie Wiar Wilcox is in the Front row, left, then Lillian Strejc, and Mort Tillman. 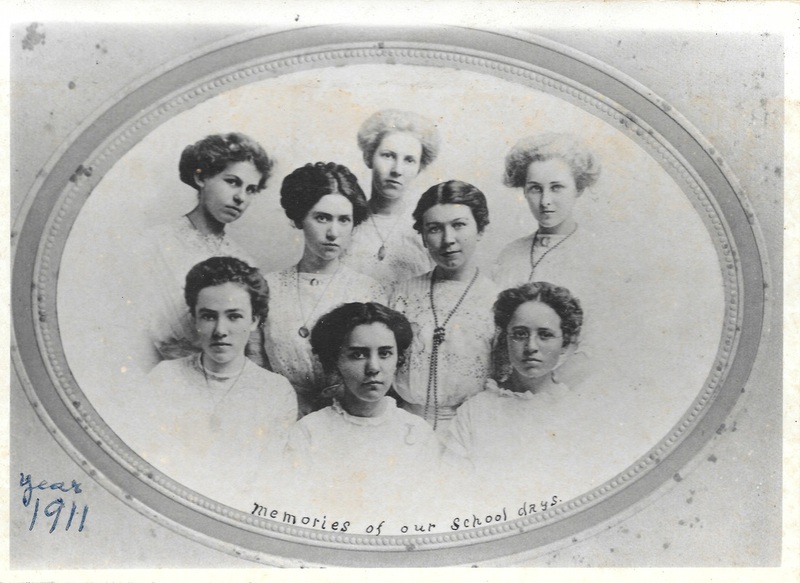 Back row: Gertrude Glenn Trump, _____ Jobe, Hazel Taylor Kuhn, Callie Barrett, and Ella Beck Smith.